From the database, users could also discover that failure to achieve job goals was not a new thing for these firms, and that MEGA officials erroneously predicted that the 2001 Visteon deal would result in 75 net new jobs by 2005 and 475 new jobs by 2008. University of Michigan economists, under contract with the state to forecast the "spin-off" jobs associated with the deal, predicted that the economic activity surrounding this deal would result in 808 new jobs through 2016. See Graphic 15 for output from MEGA's "economic effects" report for Visteon. These figures provide a baseline for determining Visteon's success or failure after it received its MEGA deal. Source: Michigan Economic Development Corp. Under the terms of MEGA agreements with firms, tax credits are delivered as rewards for actually creating promised jobs. Visteon never collected a single one of those tax credit rewards, because it never created any of the promised jobs. As shown in the MEDC summary "MEGA Credits" spreadsheet and "MEGA Credits vs. Conversions - All Companies for all Years" report, the record is clear, though the former spreadsheet is easier to read. We have posted a copy on the Center Web site as an example. Despite the fact that Visteon claimed no credits, this MEGA deal wasn't free to taxpayers. As mentioned, part of the agreement included the MEDC using its authority to arrange up to $5 million in road improvement work at the new Visteon facility. Moreover, the MEGA statute originally mandated that local units of government make incentive contributions too. As part of the Visteon deal, Van Buren Township offered property tax relief worth up to $31.2 million over 12 years, and Visteon was able to start claiming that relief immediately for a jobs deal that failed to materialize. [*] To date, Visteon has enjoyed more than $9.6 million in local abatements resulting from the failed MEGA deal. Of course, MEGA's poor performance in these cases has been influenced by the general decline in the automobile industry. Still, the job of MEGA and the MEDC is to assess the marketplace and determine which businesses to help in order to promote state economic growth. It hardly reflects well on the program that MEGA officials and state-hired economists, who sometimes provide MEGA forecasts stretching out 20 years, cannot envision MEGA firms filing for bankruptcy less than 17 months after winning a MEGA deal, as occurred with Kmart. The preceding example suggests why a database like the one created by the Mackinac Center is desirable — and why government transparency on the MEGA program should remain a priority for policymakers. [*] This was not the only MEGA agreement with which Visteon was associated. In 2004, MEGA offered a deal to Atlantic Automotive Components LLC, a company that was 70 percent owned by Visteon, according to MEDC documents. This firm too has been unable to collect on the employment tax credit it was offered. Kathy Blake, "Briefing Memo — Visteon Corporation," (Michigan Economic Growth Authority, 2001). 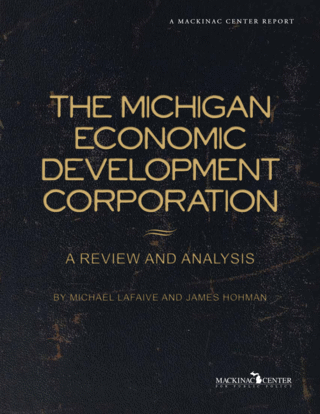 George A. Fulton, Peter Nicolas, and Donald R. Grimes, "The Economic Effects on Michigan of the Visteon Corporation Location Decision," (University of Michigan, 2001). "MEGA Credits vs. Conversions — All Companies for All Years." Blake, "Briefing Memo — Visteon Corporation." Susan Ireland, township assessor, Van Buren Township, e-mail correspondence with Michael LaFaive, June 1, 2009.